‘Mom’ is the movie of Sridevi; the film once again brings the versatile actor of our times once again on the screen after her more likeable ‘English Vinglish. The problem with ‘Mom’ is that it is unabashedly a weepy movie- a bit too much. The strict ‘Ma’m’ of the school is also a bit strict Mom at home of Sabarwals; outwardly a happy family of Anand, Devki and their daughters Arya and a little one. Ahem, there is a problem, if at all one can call it a problem. Devki is not the biological mother of Arya. However, Devki tries to show her concern and affection for Arya, the adamant and arrogant step daughter spurns it. In her own making she attends a late night party on the Valentine’s Day to be caught and gang raped by a four boys of which two are from her same school. But, the rapists easily escape through the porous and weak law system in India. But, Devki was not ready to compromise. She wants to take law in her own hands literally with a help of a funny private detective DK (Nawazzudin Siddiqui- why such hideous make up for him?) but a crime branch cop (Akshaye Khanna) on her trail. The first half of the movie moves at a better pace than the second. Towards the climax the film sags too badly. The heroism of the protagonist wears off completely till the cop unbelievably comes to her rescue. After knowing the great efforts made by her step mother in delivering the justice to the rapists, the obstinate girl turns soft and calls her ‘Mom’ instead of her usual ‘Ma’m’. It is Sridevi’s film and she does full justice to her role with ease though the weepy scenes were too many. The supporting characters do their roles well. Rahman’s music is unobtrusive. 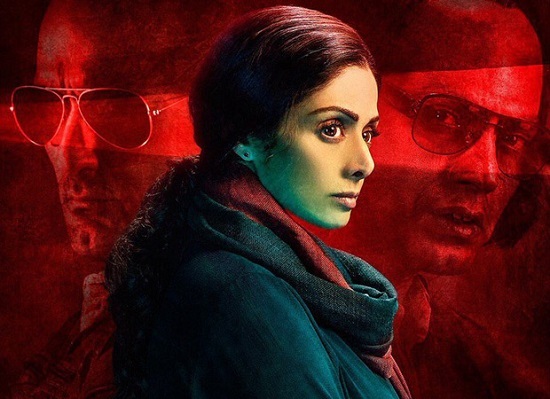 The film may be worth watching only if one is an ardent fan of Sridevi.